If a Tree Falls, Will Anybody Investigate the Claim? Los Angeles' tree-lined streets are a big part of the city's appeal. But they're expensive to maintain. 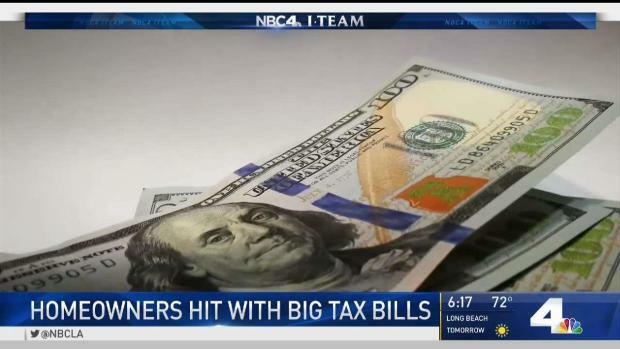 Randy Mac reports for the NBC4 News on Friday, May 4, 2018. When it comes to tree-related claims, it's a numbers game. We have a huge amount of trees and a shockingly low number of people investigating tree related claims. A big bang, a bang. That's what Joy Brown says she heard as she backed into her driveway, last August. One of the branches directly across the street from me fall and hit the top of my mom's blue car. Brown's mother, Terry Love, came out to find dents and scratches from the impact. She photographed it, got estimates to fix it and filed a claim with the city on Aug. 18, 2017 and waited. Imagine hiring a contractor to replace your roof and paint your house, and you end up on the hook for more than a quarter of a million dollars. Randy Mac investigates for the is here with the story. reports for the NBC4 News at 6 Thursday, May 3, 2018. "Didn't hear from them, wrote them another letter at the end of October, still didn't hear from them." By February 2018, Love was writing the I-Team, having heard nothing about her claim. 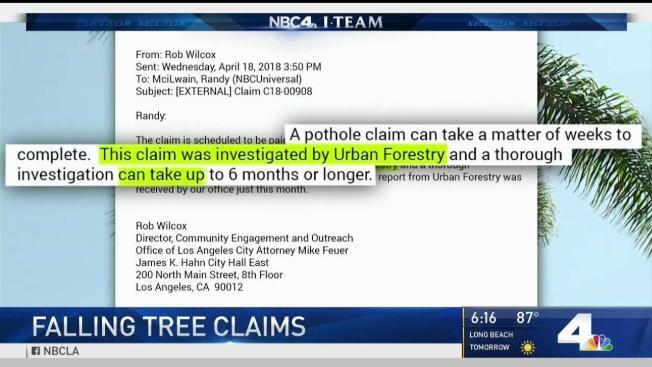 In an email, a spokesman for the City Attorney's Office, wrote, "This claim was investigated by Urban Forestry and a thorough investigation can take up to six months or longer." In Love's case it was eight months before the City Attorney's Office received the report, Love says contrast that with what happens when a citizen owes the city money. "Say if I did something to the city they'd be right after me, on me!" City policy prohibits spokesperson's from discussing individual claims so they wouldn't talk about Love's. 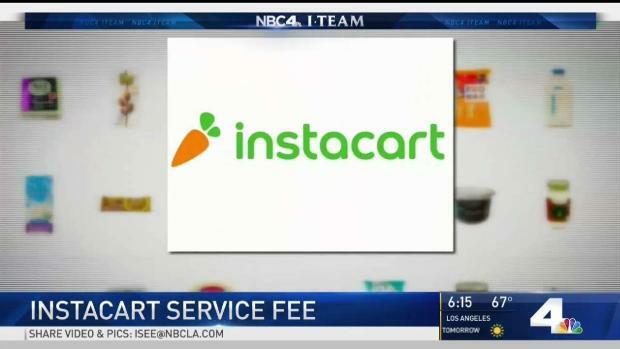 When you pay the online grocery delivery service Instacart's fees, do you know where that money goes? It's not toward a tip. Randy Mac reports for the NBC4 News at 6 Friday, April 27, 2018. Back in 2014, the I-Team started reporting on citizen complaints about falling limbs from city trees, damaging property even causing the death of Tony Calderon. "Duck and dodge cause if you don't you're going to get hurt," said Karen Lemott, who lives down the street from Love. She says the danger of falling branches is real. "They sound like big boulders coming down out of the sky. The noise they ultimately make is cha-ching." Since 2015 Los Angeles has paid nearly $6.5 million in claims due to mostly dangerous trees. Trees that get pruned every 15 years dependent on the city's budget according to the LA's Urban Forestry website which also says LA has 2 million publicly maintained trees but a city spokesperson confirms urban forestry only "has two full-time staff processing tree-related claims." 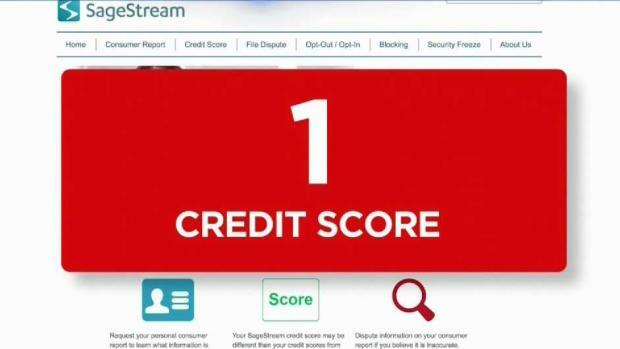 Sage Stream is a little-known credit reporting agency that could be giving you a lower credit score than the "big three" credit bureaus. Randy Mac reports for the NBC4 News at 5 p.m. on Tuesday, April 17, 2018. Love just got her check for $600, a process as slow as watching a tree grow, she says. A person shouldn't have to wait this long to have something resolved as simple as their trees are not being kept up and that people's property is being damaged. Since 2015 the city has increased funding for maintaining its trees by more than $4 million. But the Urban Forestry website acknowledges that massive cuts to its budget since 2009, continues to impact efforts to trim, remove and plant trees.